“Learners and school leavers; the sky is the limit, come and use the information in the library effectively. Parents and teachers; tell the children about the importance of education, learning and the library. School teachers and community; let’s work together to improve the level of education.” These were just some of the inspiring words from Mandisa, our librarian, in her speech at the long awaited and anticipated opening of Ikhaya Lencwadi (Home of the Books). 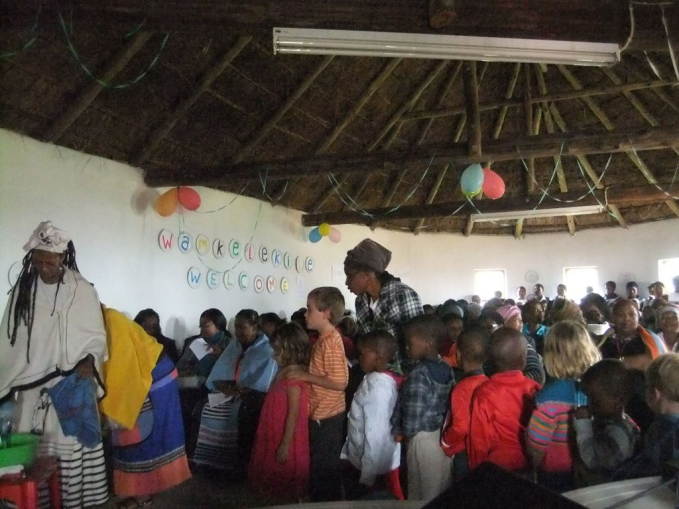 The new Zithulele community library had its grand opening on the 18th of October 2011 with an event held in the community centre, attended by around 300 guests from the community and from nearby schools. Our brave pre-schoolers performed a sketch showing how to use the library and how to handle the books, and the audience were entertained by choirs and traditional dancers from two local schools, who had even composed their own song about the library! After the performances and guest speakers, all guests were invited to go on a tour of the library and receive more information on how to use it. The event provided a great opportunity to inform people about the library and it was a successful event that was truly appreciated by the community. As one community member said during the opening, “This is the first time we have had an opportunity like this, so let’s talk to our sons and daughters about working together to support and protect the library, everyone must come to the library and read”.